We won’t post the DD60s this time as temperatures from here on out are predicted to be good for cotton planting. That is the good news. There are many places that are drying out, so the predicted rain is also potentially good news. The catch is that with thunderstorm systems, there is also a likelihood of packing rains. If you have a lot left to plant before next Friday, May 25 (1st insurance cutoff), proceed planting on well-drained ground and hold off on low land that has a tendency to saturate and sour, or soils with a history of crusting. If you don’t have much left to plant and can effectively plant it quickly once this rain passes, it may be worth it to wait. With this forecast, which at times is unreliable, there is a risk either way. It would be nice to stop planting 3 to 4 days before a packing rain is predicted, unfortunately with the unpredictability of thunderstorms and the need to finish planting this may be difficult for many growers. 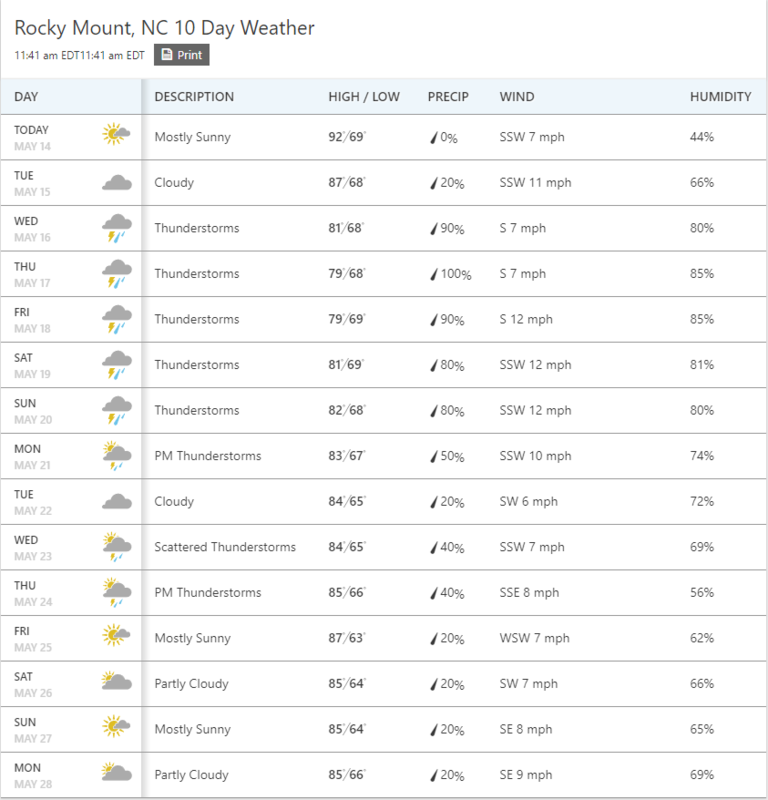 The chart below from weather.com shows the predicted weather at Rocky Mount from now until May 28. It looks like the intensity of thunderstorms will diminish after the 20th of May. Packing rains can turn otherwise optimal planting conditions into marginal conditions. Refer to Tips for Planting Cotton in Suboptimal Conditions if you need to plant when packing rains are a threat.